« Flashback. 1969 Norton Commando 750S. Published by Cyril Huze July 6th, 2017	in Customs, Editorial and Engines. In an ultra-modern 85,000 square-foot complex in California, the Cobra team designs and fabricates all sorts of performance accessories for the major motorcycle brands and models. 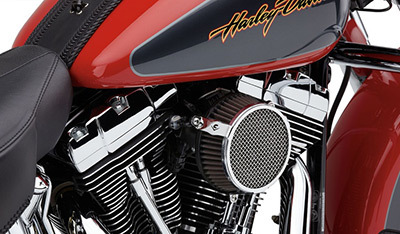 For Harleys, an important upgrade is to optimize engine air flow for maximum power. 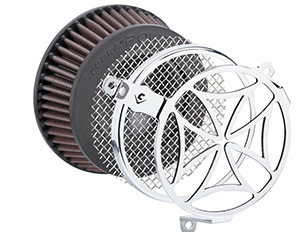 This air intake kit utilizes a Cobra-designed K&N air filter, machined aluminum venturi and a variety of covers. 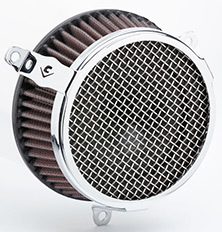 The intake pictured below consists of a laser formed steel cover, stainless steel mesh insert, and a chrome plated finish. All intake kits are available in black as well. MSRP: $220.95. Cobra Engineering. That is not a bad price. Cobra makes nice products. Cobra has been around for yonks – I suspect they know what they are doing. What does the bottom screw on the cover connect to? Is there a bracket that runs to the center case stud? Can’t seem to make sense of it. Would like to see the bottom plate – but it says there is a Venturi which i consider essential for an AC, so that is good. As for the price, well if 220 is called not bad, this must be because there are so many crazy overpriced Harley Air cleaners available which are way more expensive. So in comparison, yes not bad. It’s a stamped tin plate over an undersized $30 K&N filter with a piece of screen in it! Easygear, please follow this link to see a cut away of the intake. Chris, there are three screws which mount to the backing plate.